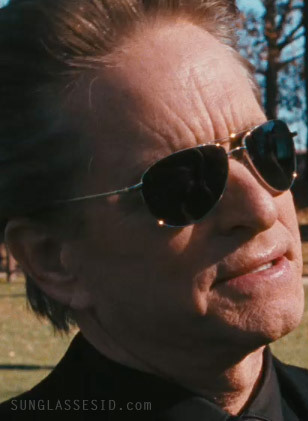 Michael Douglas wears a pair of Oliver Peoples Benedict sunglasses In the movie Solitary Man. The sunglasses seen in the film have dark lenses and a silver frame, but you can get these stylish shades in gold as well. You have a choice of Photo-chromic, Polarized, or Mineral Glass lenses. Get them at the Oliver Peoples store or at Amazon.com. Douglas also wears Benedict in Beyond the Reach (2015). In the movie Michael Douglas wears a yellow t-shirt wth the text "Keep the Spirit Alive. High Five" (see screenshot on the left). This exact t-shirt is available at PrankPlace.com.